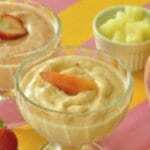 Frozen Fruit Yogurt | JPMA, Inc. If leftovers are stored in the freezer, the mixture will be very firm. Scrape into serving bowls with a spoon or freeze the leftovers in frozen treat molds.